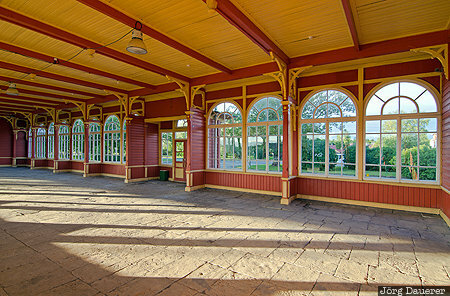 The passenger terminal of the wooden Haapsalu Railway Station with its big windows facing the platform and the shadow of the windows on the stone floor. Hapsalu is in Lääne in the west of the Baltic state Estonia. This photo was taken in the evening of a sunny day in June of 2014. This photo was taken with a digital camera.